Like in fantasy settings, cantinas and bars are an essential part of sci-fi and cyberpunk settings. 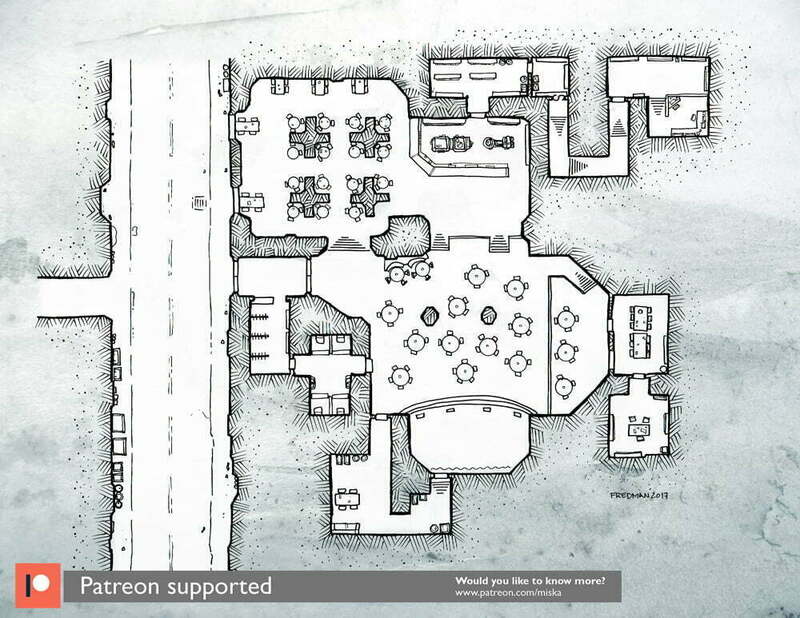 This bar was based on one of my higher tier patron’s wishes and it has two separate areas: one with small tables and more privacy for shady deals, and another area with a stage for bands and other performers. There’s also a VIP area with gambling tables and the bar owner’s office. Behind the bar desk and the storage room there’s a secret access to a hidden rooms with equipment for various illicit operations like black market deals or running a insurgent activities. Thank you, Miska 🙂 I turned it into Morlock outpost in a post-apocalyptic OSR game. This one will work for cyberpunkt games, too!